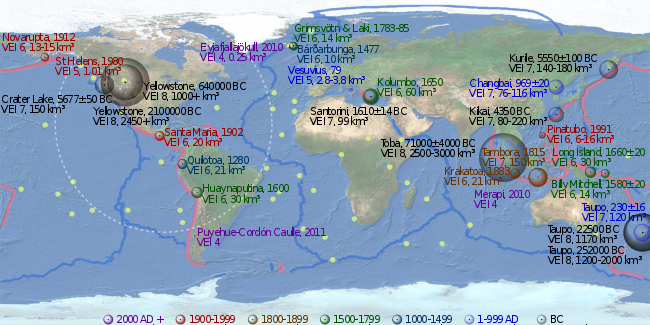 About 40 eruptions of VEI-8 magnitude within the last 132 million years (Mya) have been identified, of which 30 occurred in the past 36 million years. 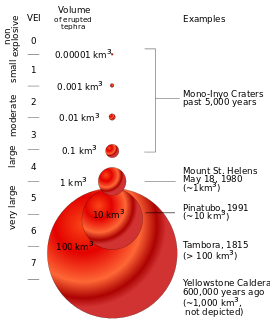 Considering the estimated frequency is > 50,000 years, there are likely many such eruptions in the last 132 Mya that are not yet known. Based on incomplete statistics, other authors assume that at least 60 VEI-8 eruptions have been identified. The most recent is Lake Taupo's Oruanui eruption, 25,360 years ago, which means that there have not been any Holocene eruptions with a VEI of 8. ^ a b Dosseto, A. (2011). Turner, S. P.; Van-Orman, J. A., eds. Timescales of Magmatic Processes: From Core to Atmosphere. Wiley-Blackwell. ISBN 978-1-4443-3260-5.